Remaining 14,000 outages should be repaired by late Friday. Crews continue working in hardest-hit communities. 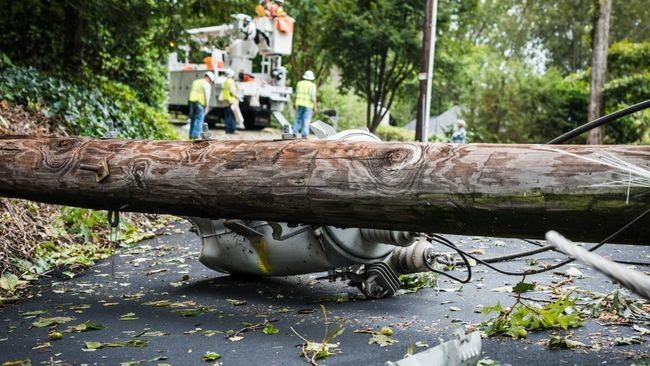 CHARLOTTE, N.C. -- Duke Energy has repaired 368,000 power outages in North Carolina's Piedmont and mountain areas and South Carolina's upstate region since Tropical Storm Irma's high winds pummeled both states earlier this week. The company expects to repair the remaining 14,000 outages by late Friday night, if not sooner. Specific restoration times for impacted areas are available at https://news.duke-energy.com/irma – or by calling 1-800-769-3766. Remaining customers without power are located primarily in six communities where the most severe power line damage occurred: Travelers Rest, Anderson and Clemson, S.C.; and Franklin, Cherokee and Cashiers, N.C.
"Our 3,800 repair workers will continue to focus on these hard-hit areas until every last customer's lights are back on," said Tim Tripp, Duke Energy's director of storm response for the Carolinas. "Our customers in both states have been extremely patient as our repair crews have worked long hours to restore power quickly and safely," Tripp said. "We greatly appreciate our customer's understanding and the many acts of kindness they have extended to our crews in their local communities." Stay away from power lines that have fallen or are sagging. Consider all power lines energized as well as trees, limbs or anything in contact with power lines. Click here for a video demonstration and to read more about safety around power lines. If your meter box is pulled away from your house – and you have no power – the homeowner is responsible for contacting an electrician for a permanent fix. In some instances, an electrical inspection may be required before Duke Energy can reconnect your service. Your electrician should be aware and advise you accordingly. If the meter box is pulled away from the house – and you have power – you should call an electrician to reattach the meter box. Again, an electrical inspection may be required. Duke Energy has invested more than $2.7 billion in the Carolinas to harden and upgrade its power delivery system since 2004. In addition to trimming trees and inspecting / replacing wood poles, the company has invested in grid automation and smart grid technologies, which improve service reliability and reduces the length and number of outages year-round. The company is also moving forward with billions of dollars of investments in the Carolinas that include such grid hardening efforts as moving underground some overhead services that are routinely affected by dense vegetation and retrofitting hundreds of thousands of transformers with new technology to prevent animal interference and lightning strikes. For storm or power restoration updates, follow Duke Energy on Twitter, LinkedIn, Instagram and Facebook. For more information, visit https://news.duke-energy.com/irma.